Scanner Sombre is a horror game from Introversion Software, the studio responsible for Prison Architect. 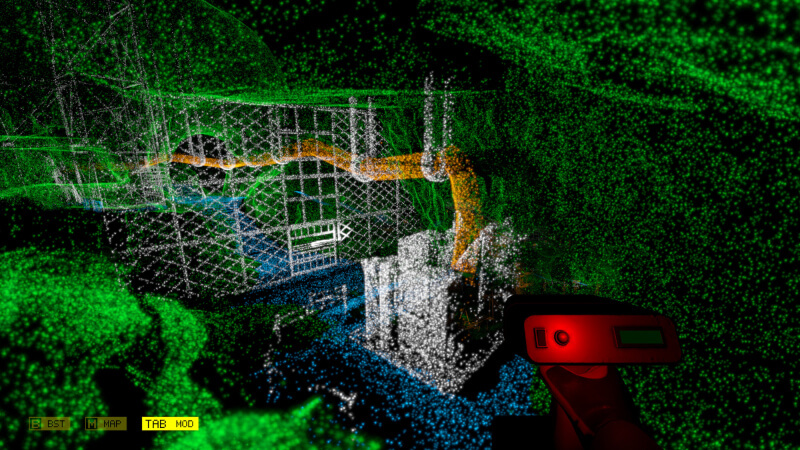 Similar to games like Outlast and Daylight, Scanner Sombre drops the player into a dark environment in which they have to navigate with limited visibility. In Daylight, the player is given a cell phone and glow sticks to help see in the darkness. Outlast lets the player use a camera that has a night vision mode to navigate in the dark. Scanner is different in that the environment (a cavern) is pretty much pitch black. In the other games you could make objects out in the darkness but just could not see them well. In this game, the LIDAR is the only way you can see what is around you. When you trigger the scanner, the environment lights up with colorful dots. It started out mainly as just a game mechanic concept. However, they decided to go forward with the idea and create a short game with it. Cris Delay, the lead designer on the project, got the idea from the Radiohead music video for House of Cards. The video was made without lights or cameras. Instead, LIDAR was used to collect data on the shape and distance of objects, such as lead singer Thom Yorke’s face, and then visuals were created from the data using a computer. He liked the concept for the game because it was a departure from what the studio had previously done. They had just spent over six years working on Prison Architect and Delay was ready to move on to something else. Wrong Wire, a bomb-defusing game, was another possibility for the creators to develop, but Delay liked the Scanner idea more because it was so different. The Verge says the game plays like Everybody’s Gone to the Rapture or Firewatch, so it is not a tricky action game with lots of dying and steep learning curve. Mostly it is just a spooky narrative that involves exploring the cavern. That said, the game only takes four or five hours to complete. So even for those who are not into such games, it is not a huge time investment to check it out. The game will sell for $11.99, but will be reduced to $9.99 for the launch. Scanner Sombre releases this Wednesday, April 26, on Steam, GOG, and the Humble store.